1. Lock in the best price of the year before the Spring price increase. Voucher packs are one time use and can't be split. 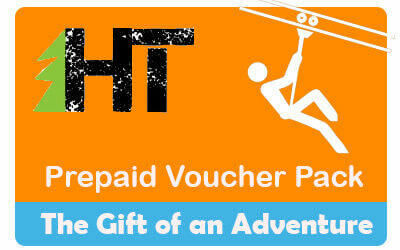 You are required to use the full voucher in one visit. For multiple visit Punch Cards, see below. Tickets are for 90 minute all-inclusive ziplining and ropes course access. Admission is unrestricted for any day of the year when we are open. Available in 1,2,4,6 packs. Voucher code will be issued via email within 24 hours of purchase. Sales tax is also collected up front so no sales tax will be required at the time of redemption. Vouchers can be used to book online in advance. Tickets expire 12-31-2019. 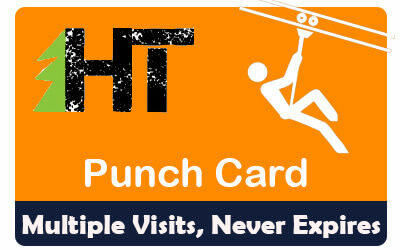 If you are or plan on being a regular visitor to High Trek Adventures, a punch card is a great way to go. Why buy a Punch Card? 1. You will get a savings off of the regular price of admission. 2. Punch card punches can be redeemed 1 at a time over the course of several visits to the venue, whereas a Voucher is a one use paid admission for the number of participants in the pack. 3. Use "punches" for yourself or your guest(s). 4. A Punch Card never expires so you can redeem them over the course of multiple years whereas a Voucher is only good for the calendar year specified at the time of purchase.